Below are some Town Council meeting highlights from last month and some upcoming topics. As always, I hope you can join us for tomorrow’s meeting or consider sharing your feedback with us about any of these matters. Town Council voted to approve, on first reading, an ordinance to making minor housekeeping amendments to the Community Development Code. These are generally technical amendments identified by staff as needed to improve the zoning/development code administration. The Telluride Distilling Company will open a tasting room on December 22 in Mountain Village Center with the recent approval of a State of Colorado off-site tasting room permit. Manufacturing operations will continue at their Lawson Hill location. Town Council reviewed and approved, on first reading, the 2019 and revised 2018 budgets. Uptown Services, LLC presented their Broadband Feasibility Study results. In 2019, the town is undertaking a major upgrade to our Broadband network infrastructure, which will allow us to offer improved 1G fiber services to every home. After completing the Request for Proposals (RFP) process, design, and engineering in the first half of 2019, the town aims to begin construction next summer and complete the project by the end of year 2020. Lastly, we received reports from Bill Jensen with Telluride Ski & Golf and the Town Hall and Village Center Subarea Committees. Town Council will vote to approve the 2019 and revised 2018 budgets. A budget-specific email will be sent out later this month, which will review the coming year’s budget and the funding of upcoming projects. In response to new state legislation that became effective September 1, 2018, the council will consider a proposed resolution to adopt a policy concerning the destruction, disposal, and protection of records containing personal identifying information. The new law requires government entities to not only adopt a policy regarding destruction and protection of these personal records but also includes requirements regarding protecting personal identifying information, reporting breaches of personal identifying information, and contracting with third parties that might handle personal identifying information. As part of our ongoing efforts to secure workforce housing, Town Council will consider waiving the lottery sales requirement for a deed-restricted unit at Cassidy Ridge to allow the town to purchase this unit. If approved, we will also consider authorization for the town manager to negotiate the purchase of this condo on behalf of the town. Telluride Ski and Golf (TSG) is requesting approval for an equestrian Conditional Use Permit (CUP) to provide horse-drawn sleigh rides. The third-party run operation will run seasonally from December to April. The application proposes four 45-minute tours daily. We will consider adoption of a Village Court Apartments’ rental policy and potential rent increases. Rental rates last increased five years ago. A rental increase policy could allow the town to avoid significant future rental increases. In addition, a policy is necessary to aid in responding to occupancy fluctuations and to keep up with ongoing maintenance needs. EcoAction Partners will present the results of the 2017 Town of Mountain Village Greenhouse Gas Inventory Report. Colorado Flights Alliance, Marketing Telluride Inc., and the Town Hall and Village Center Subarea Committees will provide their reports. After months of direct negotiation between principal-designated representatives, in April Town Council approved a term sheet regarding settlement of the 161C-R and Ridge at Telluride litigation. Per the terms of the settlement, the Ridge Development is submitted an Alternative Parking Requirements Application requesting a reduction in the required parking to one parking space per condominium unit from the two parking spaces required by the Community Development Code. Town Council unanimously voted to approve the request for reduced parking contingent on the final ratification of the settlement agreement by all parties. The town’s Wildfire Mitigation Incentive and Cedar Shake Incentive Programs were created to support our property owners’ efforts to lower the wildfire risk on their land. Town Council moved to contract out the required site walk and tree-marking services to West Region Wildfire Council. For more information about participating in these programs, please contact the Planning Department. Public Works Director Finn Kjome provided the monthly update on our current drought status and water restrictions. Monthly water updates will continue until restrictions are lifted. Additionally, Police Chief Chris Broady provided an update about our current wildfire risk and ongoing fire restrictions. Angela Pashayan was reappointed to the Ethics Commission and Jonathan Greenspan was reappointed to the Community Grant Committee. Thank you to all the residents who volunteered to serve on these boards. Our community is very fortunate to have such engaged and generous members. Lastly, we received reports from EcoAction Partners, Telluride Ski & Golf, and the Town Hall and Village Center Subarea Committees. Telluride Bluegrass Festival is requesting the continued use of on-street parking for their four-day event. When Town Council discussed this request last November, we recognized the economic significance of the festival but expressed that the residential impacts must be better addressed and mitigated. After months of discussion, a new proposed agreement was outlined calling for a 150% increase in the cost of parking, approximately $100,000 in town revenue annually. If Town Council approves the proposed five-year agreement, the Bluegrass Festival will be the only festival or event to which the town extends an on-street parking privilege. The additional revenue would be earmarked for future Gondola Parking Garage upgrades. Over the years, Telluride Ski and Golf (TSG) has provided the town with various licenses, easements, and other conveyances that have been necessary as our town has grown and developed. TSG has asked the town to acknowledge this assistance as “Public Benefits”, as envisioned by the Comprehensive Plan. Town Council will consider whether to formally acknowledge these public benefits in a Memorandum of Understanding. Note: the town cannot assign any weight or value to these benefits at this time. The value of public benefits can only be made in conjunction with any future land use applications. Town Council will appoint a residential representative to the Telluride Regional Airport Authority (TRAA) Board. Lastly, we will receive reports from Telluride Tourism Board, TRAA, Green Team Committee, and the Town Hall and Village Center Subarea Committees. Chief Broady updated us about our current wildfire risk, and Bikis Water Consultants provided an in-depth update on our current drought status and water restrictions. Monthly water updates will continue until restrictions are lifted. We approved on first reading two ordinances to: (1) approve a Major Scale Subdivision for Lot 151R and (2) rezone it from Multi-Family to Single-Family – changing four condominium units to three single-family units. At the next Town Council meeting, a second reading and public hearing will be held prior to us voting on these ordinances. Town Council approved Conditional Use Permits for Telluride Ski & Golf (TSG) to operate a Mining Sluice and Trampoline in Heritage Plaza and a Ropes Course on Lot OS 3U (near the base of lift 4). We received an update on the status of the Mountain Village Defensible Space Incentive Program and discussed potential regulations to address removal of dead, diseased, and beetle-infested trees on private property. The primary goal of the town’s fire mitigation and forest management policies has focused on encouraging residents to create defensible space around their homes via the Defensible Space Initiative Program and replace wood roofing materials using the Cedar Shake Incentive Program. Town Council approved on second reading an amendment to the Community Development Code (CDC) to modify roofing requirements and allow for more permitted materials in the Village Center. Lastly, we will receive reports from Colorado Flights Alliance, San Miguel Regional Housing Authority, and the Town Hall and Village Center Subarea Committees. Town Council will consider a resolution to sell an affordable housing unit, Cassidy Ridge Unit C201, to a town employee via a weighted lottery system and based on ongoing town-employment requirements. The Town Charter requires that Town Council approves any sale of town-owned property. The town has gone through the lottery system and is set to sell the unit to an employee with a closing date of August 7. All proceeds from the sale go back into the Affordable Housing Fund. After months of direct negotiation between principal-designated representatives, in April Town Council approved a term sheet regarding settlement of the 161C-R and Ridge at Telluride litigation. Per the terms of the settlement, the Ridge Development is submitting an Alternative Parking Requirements Application with a request to reduce the required parking to one parking space per condominium unit from the two parking spaces required by the Community Development Code. o The town’s net position increased $4.2 million – up from $52.6 to $56.8 million. o Sales tax collections continue to establish new record levels – exceeding $4.26 million for the first time. o Development-related revenues exceeded prior year by over 100% – contributing to surpluses building the town’s General Fund reserves to $10.9 million. Due to recent staffing changes, Town Council will consider short- and long-term options to support forest health and mitigation program administration. To continue offering these programs, we will be considering a proposal to move forward in the short-term by contracting for the necessary tree-marking services while a Request for Proposals (RFP) for longer-term services is in the works. I am hopeful we can find a solution that allows us to continue offering the Defensible Space Initiative Program and the Cedar Shake Incentive Program to property owners without interruption during the program’s busiest season. Public Works Director Finn Kjome will update us on the current drought status and ongoing water restrictions. Lastly, we will receive reports from EcoAction Partners, Telluride Ski & Golf, and the Town Hall and Village Center Subarea Committees. Town Council held a worksession to determine best practices in adopting and implementing an open, fair, and robust public comment policy and this month we will review a proposed policy based on this discussion. Town Council approved on first reading a Community Development Code (CDC) amendment regarding Village Center roofing requirements. Due to the unavailability of the original burnt sienna concrete tiles, the proposed amendment would allow for more permitted materials in the Village Center. This month, Council will hold a public hearing and vote on this amendment. Public Works Director Finn Kjome provided an in-depth update on current drought status and water restrictions. Council has requested monthly water updates until restrictions are lifted. Chief Broady updated us about our current wildfire risk and direction was given to make the community aware of the Stage 1 fire restrictions currently in effect. Lastly, the Town Hall and Village Center Subarea Committee provided their monthly update, and Marketing Telluride Inc. (MTI) presented their quarterly report. Mountain Village Police Chief and Telluride Fire Protection District staff will update Council about our current fire risk, and we will consider additional fire restrictions. Bikis Water Consultants will provide a drought conditions update and answer questions regarding the town’s water supply and rights. There will be a worksession to discuss potential rent increases for Village Court Apartment in 2019. We will consider a Major Scale Subdivision for Lot 151R and hear the first reading of an ordinance to rezone the lot from Multi-Family to Single-Family – changing four condominium unit designations to three single-family unit designations. Town Council will consider Conditional Use Permit applications to allow a Mining Sluice and Trampoline in Heritage Plaza and a Ropes Course on Lot OS 3U (the base of lift 4). We will discuss potential programs to address the removal of dead and diseased trees. Additionally, we will get an update on the Mountain Village Defensible Space Incentive Program. On May 31, a Special Town Council Meeting was adjourned to consider an amendment to extend the February 15, 2018 Standstill Agreement between Town of Mountain Village and Northlight Trust, the owners of Lots 126R and 152R. The Standstill Agreement required a new PUD application be submitted by June 15, 2018. Due to extensive public comment and other factors, the landowner requested that the deadline be extended by approximately 90 days to September 14, 2018, to consider the feedback they have received and further evaluate their Alternative Development Plan. Town Council approved the extension as the speed in which the application is filed is not as important as having plenty of opportunity for dialog, reflection, and refinement. You can review minutes from the meeting or watch the video at the town website. Walk with the Mayor – I’m looking forward to seeing you tomorrow for our first monthly walk and a chance to talk about current events and projects that interest you. The monthly event takes place from 10 to 11 a.m. and meets at the Heritage Plaza Fire Pit in Mountain Village. Below are some Town Council meeting highlights from last month and some upcoming topics, but first please read a quick note about our water conservation measures. As always, I hope you can join us for tomorrow’s meeting or consider sharing your feedback with us about any of these matters. Quick note: Due to extreme drought conditions throughout southwest Colorado, last month Town Council approved initiating water conservation measures beginning on May 1. As of April 9, San Miguel County 34% of average snowpack, and due to an unseasonably dry and warm spring the average snowpack was at 21% as of May 4. On May 10, our region was classified as “Exceptional Drought,” which is the highest level of drought classifications issued by the National Weather Service. To illustrate how extreme these conditions are, our neighboring county in Montrose was classified this month as a natural disaster area due to crop losses and damages caused by this drought. These extreme drought conditions impact not only us but our neighbors downstream in the Norwood area and beyond, who hold more senior water rights than ours.The last time our region was in a drought of this nature was in 2002. In 2002, a call was placed on the San Miguel River on June 21 and extended through October 31; however, the San Miguel River never dropped below 6.5 cubic feet per second at the Mahoney Street Bridge, which is a crucial threshold. However, this spring the in-stream river flows are running lower than they were in 2002, during the same period. When a call is placed on the San Miguel River it means junior water rights must cease diverting/using water in order to supply senior water rights in the Norwood area, which impacts the town’s ability to use its water supply fully. While the town has good water rights that are not junior to many other water users, there are water rights on the San Miguel River that are senior to the town’s rights.Per the town’s water rights and in-stream flow requirements, should the San Miguel River flow drop below 6.5 cubic feet per second at the Mahoney Street Bridge, further water restrictions will be necessary and required. The town’s current water restrictions are geared towards avoiding a call on the river from neighbors with senior water rights. Also, if the region experiences a significant increase in moisture the town may rescind its water conservation efforts. We appreciate your patience, as this is a very real issue the town is facing, and we will continue to keep you up-to-date as the situation evolves. After months of direct negotiation between principal-designated representatives from Lot 161C-R, The Ridge HOA, The Ridge Club, some of The Ridge owners, and the town, Town Council approved a term sheet regarding settlement of the 161C-R and Ridge at Telluride ongoing litigation. Town Council approved the use of action minutes as the official record of all Town Council meetings. Action minutes will be compromised of an objective record of motions, votes, and names of speakers during public comment and/or public hearings without a summary of some discussions, as was previously found in narrative minutes. The town will continue to record and retain all Town Council meetings via video and audio. We approved the following Green Team Committee initiatives: calculation of an updated Town of Mountain Village Greenhouse Gas Inventory, development of a Compost Incentive Program, and launch of a Farm to Community Pilot Program. The Town Hall and Village Center Subarea Committee provided their monthly update. The Village Center Subarea Committee is currently made up of two members each from the town, Telluride Mountain Village Owner’s Association (TMVOA), and Telluride Ski & Golf (TSG); the committee updated Council that they will be adding one lodging and one merchant member to their team, as well. Town Council discussed Trails Master Plan, which is focused on reviewing trails in and around the existing town network, evaluating the feasibility of proposed trails identified in the Mountain Village Comprehensive Plan, and providing further recommendations for future trails based on the community’s vision and goals. If you would like more specifics about any of these topics, you can review minutes from the meeting or watch the video at the town website. We will receive an update on the Telluride Regional Wastewater Treatment Plant Master Plan (TRWWTP) regarding the ongoing and future major upgrades to the plant located at Lawson Hill. The two primary goals of the plan are upgrading facilities to comply with new federal treatment and outflow standards and increasing capacity to manage current and future demand. Over the years, Town Council has adopted a public comment policy through the Rules of Conduct of Public Meetings Policy but has not strictly followed nor publicized this public comment policy. This worksession will provide an opportunity for us all to discuss best practices in adopting and implementing an open, fair, and robust public comment policy. As part of our annual budgeting process, we will have a worksession to help establish and refine the budget goals for projects, programs, and infrastructure in 2019. The Finance Committee and town staff will use this direction as they draft the 2019 budget. Town Council will hear on first reading a Community Development Code (CDC) amendment regarding Village Center roofing requirements. Due to the unavailability of the original burnt sienna concrete tiles, the proposed amendment would allow for more permitted materials in the Village Center. Lastly, the Town Hall and Village Center Subarea Committee will be providing their monthly update and Marketing Telluride Inc (MTI) will present their quarterly report. Reminder: Beginning June 5, I will be hosting monthly walks on the first Tuesday of every month. I’m looking forward to this opportunity for us to talk about current events and projects in our community. Stay tuned for more info. Town Council reappointed Banks Brown, Luke Trujillo, David Craige, and Keith Brown to the Design Review Board (DRB). I want to thank all the candidates who volunteered to serve. We are fortunate to have so many engaged and highly-qualified community members willing to serve. The DRB is made up of seven full-time members and two alternate members, who are all appointed by Town Council to two-year terms. We approved a Village Center Subarea Memorandum of Understanding (MOU) between the Telluride Mountain Village Owners Association (TMVOA), Telluride Ski& Golf (TSG), and the Town of Mountain Village focused on the existing Village Center Comprehensive Plan. Specifically, the goals of the Town Hall and Village Center Subarea Committee will be to promote and enhance vibrancy and address long-term infrastructure, future build-out, and optimal uses of the Village Center, in accordance with the Comprehensive Plan. Council decided to opt out of the Colorado voter signature verification requirement for municipal elections. The voter signature verification is facilitated through the statewide voter verification system and since our Town Charter allows non-resident property owners to vote in municipal elections, many eligible voters signatures would not be in the Colorado-based verification system. Given the availability of free day parking in the Gondola Parking Garage and the newly-approved parking lot on 161C-R, Council voted to permanently eliminate employee permit parking on Upper Mountain Village Boulevard (UMVB). In its place, a new shoulder-season Employee Permit Parking Program will be developed with the same eligibility requirements as the current UMVB permit but will instead be valid in both the North Village Center Parking Lot and the Heritage Parking Garage during the shoulder-seasons. Town Council will consider a term sheet regarding settlement of the 161C-R and Ridge at Telluride litigation. This is the result of months of direct negotiation between principal designated representatives from Lot 161C-R, The Ridge HOA, The Ridge Club, some of The Ridge owners, and the town. We will consider approving the use of action minutes rather than narrative minutes as the official record of all meetings of the Town Council. Action minutes would be compromised of only an objective record of motions, votes, and names of speakers during public comment and/or public hearings without a summary of some discussions, as found in narrative minutes. The town would continue to record all Town Council meetings via video and audio, which we would maintain as we do now. As we all noted this winter, it has been an extremely dry year and these arid conditions may continue throughout the summer. To address the situation proactively, Town Council will discuss drought planning tactics such as initiating water restrictions in May, in an attempt to conserve water from the start of irrigation season rather than waiting until June when we could potentially be in a more sensitive drought situation. We will hear an update on the Meadows Improvement Plan. The Green Team Committee will present proposals for three projects: production of an updated Town of Mountain Village (TMV) Greenhouse Gas Emissions Inventory; consideration of a Compost Incentive Program; and consideration of an income-qualified Farm to Community Pilot Program. The Town Hall and Village Center Subarea Committee will provide an update. Town Council will review a Trails Master Plan RFP (Request for Proposals) seeking to develop a comprehensive trails plan for the town, and the immediate surrounding area, according to the Open Space and Recreation Vision outlined in the Mountain Village Comprehensive Plan. The plan will look at trails in and around the existing town network, evaluate the feasibility of proposed trails identified in the Comprehensive Plan, and provide further recommendations for future trails based on the community’s vision and goals. At the February 15 Town Council Meeting, Council voted unanimously to approve a Standstill Agreement with Northlight, the owners of Lots 126R and 152R (historically referred to as “Rosewood”). Since then, many of you have reached out with questions about these lots, the scope of the project, and the Standstill Agreement – below are responses to a few of the most common questions. What is the original zoning and density of the Rosewood lots? Can we revert to the original zoning of these lots? In 1984 and 1987, the properties that came to be known as “Rosewood” were originally platted as a mix of hotel, condo, commercial, and employee units with a total density of 310 units. The platting was executed by Ron Allred/Telluride Company, with approval by the Board of County Commissioners and the County Planning Commission. By 2007, through the course of land purchases and rezoning with the planned unit development (PUD) approval, this parcel of lots consisted of more condo units, fewer hotel units, and 38,666 square foot of designated commercial property with a combined density of 345 units. The development history of these properties through the years is extensive and available online. 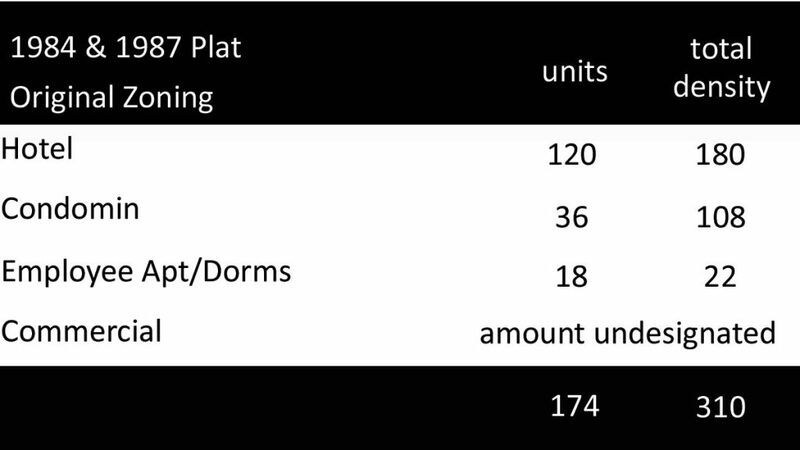 I share this snapshot to illustrate that going back to the original platting, is not straightforward and would call for 310 density units. Since the original platting of these lots, the zoning of these properties has always included a hotel, condo, and commercial units. 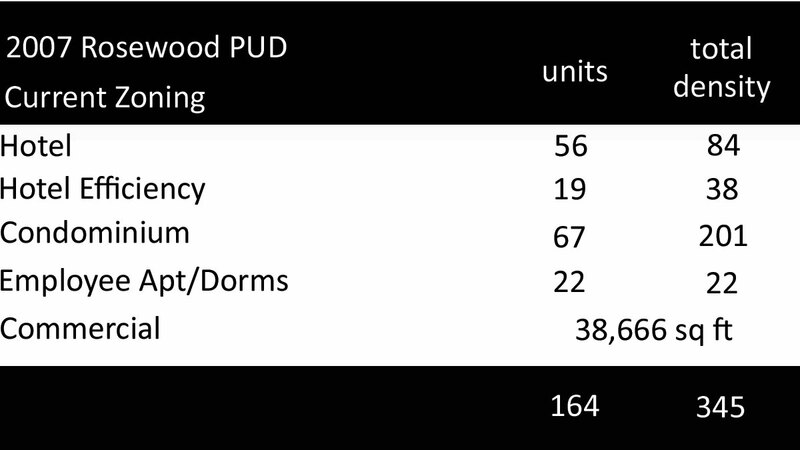 The zoning history and density units are not solely a function of the 2007 PUD but also are tied to the Original Zoning that has run with these properties since they were first platted in 1984 and 1987. What is the Standstill Agreement? Isn’t the Standstill Agreement just an extension of the 2007 PUD? The Standstill Agreement is not an extension of the 2007 PUD, and it instead requires a new PUD application, if the owners desire to proceed. The town chose to move forward with the Standstill Agreement because it barred any development on the lots during the term of the Standstill Agreement; requires a new PUD application, which will be reviewed by the community, DRB, and Town Council; and must be approved only through the open, public process by Town Council. The 2007 Rosewood PUD expired on March 31, 2018. However, the owners of the properties would have still been able to move forward by filing an application to build by right had there not been a Standstill Agreement. The Standstill Agreement will remain in effect through all phases of a new PUD application process. It is important to note that the Standstill Agreement does not imply that any application will be approved or that the application will be reviewed in an expedited manner. The applicants must follow the town’s process as detailed in section 17.4.12 of the Community Development Code. Per the terms of the Standstill Agreement, any new PUD application must have significant reductions to the overall mass and scale of the expired 2007 project plans and make substantial reductions to the land use and densities occurring on the property. Furthermore, before submitting any new application, the applicants are required to hold two public open house meetings to obtain community feedback. The first public open house meeting was held March 28 and the next scheduled public open house meeting will be held May 10 at the Mountain Village Town Hall. Additionally, Northlight has agreed to hold a conceptual Work session, which will be open to the public, and a third public meeting this summer. These meetings will be live-streamed and available for viewing afterward. Will the Town Council be reviewing the 2007 PUD or a new PUD? What happens next? Once the town receives a new PUD application, we will send out a formal outline of the timeline and steps required per the town’s PUD process. This project has been a hot topic for decades, and I expect that many of us on Town Council and throughout the community will not always agree on the best ways to proceed. Regardless, it is imperative that we all remember we are neighbors, above all else, and as such we should discuss and evaluate these topics with respect and candor. We have a shared responsibility to our village so please take part in the public process and email or call me with any specific questions or concerns you may have. On a related note, beginning June 5, I will be hosting monthly walks on the first Tuesday of every month. I hope this will be an opportunity for us to have open conversations while we discuss current events and projects. Stay tuned for more info. San Miguel Regional Housing Authority (SMRHA) has contracted with Economic and Planning Systems and RRC Associates to complete a Housing Needs Assessment for San Miguel County. As part of this effort, a survey on housing issues was mailed this week to households in San Miguel County and surrounding communities. If you are a local renter or homeowner living in San Miguel County or the surrounding region (Ridgway, Norwood, Nucla, Naturita, Rico), please look for the survey in your mailbox. Local residents and commuters working in San Miguel County are also welcome to complete the survey online at the SMRHA website home page, www.smrha.org. The survey will remain open through April 30, 2018. We hope you will take a few minutes to complete this important survey. The results will help SMRHA and local governments make key decisions on the amount, type, and location of new housing to build in the future. The survey is completely confidential, and in appreciation, all respondents will be eligible to enter a random drawing for one of three $100 grocery store gift certificates.